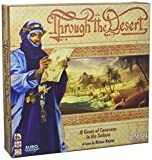 If you wish to customize your games of Through the Desert, you can use any of these variant rules. The reverse side of the board shows the Niger river running through the southern Sahara and offers players a new tactical challenge. During setup, you may place leaders in spaces next to the river. All other leader placement rules are unchanged. During the game, placement rules are the same, but the first time that each of your caravans "crosses" the river, take a 5-point token. During setup, players can use a serpentine order for leader placement. In a four-player game, standard leader placement proceeds clockwise from the first player: A (first player) - B - C - D, repeat. Serpentine leader placement begins like standard but then reverses the order, counter-clockwise from the last player: A - B - C - D - D - C - B - A, repeat. Many water sources in the desert are actually aquifers, underground reservoirs of water just beneath the surface. Typically accessed by digging wells, you usually do not know the size of the aquifer until you draw water from it. During setup, place waterhole tokens as normal, but place them face-down instead of face-up, returning any remaining waterhole tokens to the box without looking at them. Waterhole tokens taken during game play are still kept face-down until the end of the game. During the game, you may secretly look at any tokens you have taken without showing them to the other players.